This Homemade Spanish Rice is perfect with chicken, beef, tacos and more. Mexican food is one of my favorite cuisines, though I find I don’t cook Mexican and other Spanish dishes nearly often enough. Even though Mr. Savvy and I have don’t have any known Mexican heritage, like many other Americans, we enjoy celebrating Cinco de Mayo in spirit with lots of yummy Mexican food. So, I thought I’d share a few of our favorite Mexican-style dishes for the day. First up is this super tasty homemade Spanish rice. I actually remember having Spanish rice for the first time as a child. I guess I just loved it so much that I actually remember my first time having it. My family was driving to our yearly beach vacation and stopped at a Mexican restaurant for a meal along the way. I don’t remember anything else about the meal except for the Spanish rice that I immediately became infatuated with. Apparently, the restaurant was a hit as I still recall stopping there every time we went to the beach years after and always looking forward to the Spanish rice. I think as a child I probably just loved the neat reddish-orange color since I had always loved rice. Moving into my adult years, I still loved Spanish rice, though now it was for the flavor. The light hint of tomato with spices and chilies, maybe topped with a bit of cheese and I always made sure to pair it with refried beans and my entree of choice at the local Mexican restaurants. As always, though, I love trying to make dishes at home myself. I started out with a very basic method of cooking rice with various tomato products and over the years have tweaked it to have more spice and flavor and be pretty much perfect. My homemade Spanish rice is pretty mild, with just a slight kick. If you don’t like spice at all, you can use plain tomatoes and onions or if you like it even spicier, you can, of course, use hotter chilies and peppers. I also really enjoy having corn in this dish even though it isn’t traditional. It just adds a nice slight sweetness and texture difference from the spice. I think it would also be great with peas instead and of course is just as good without either. This Homemade Spanish Rice is the perfect addition to any Cinco de Mayo or Mexican, Spanish, etc. meals. Melt butter or heat oil in large skillet or pot over medium heat. Add onions and cook for about 3 - 4 minutes until slightly softened. Reduce heat to medium-low and add garlic and rice, stirring constantly for 2-3 minutes until rice is slightly toasted and puffed. Make sure you keep stirring so it doesn't burn. Stir in chili powder, cumin, Rotel and corn and cook for another minute or so. Stir in broth and increase heat to medium to medium-high and bring to a boil. One boiling, reduce heat to low and simmer for about 20-25 minutes until rice is done. Around the 15 minute mark, check rice to see if it needs more liquid. Try to not open the lid unless you need to add more liquid as this can result in sticky rice, which is why I prefer using a pot with a clear glass lid for this recipe. Once rice is done, serve with chopped green onion, cilantro, chilies and/or shredded cheese, if desired. Don't like spicy foods? Use plain tomatoes and onions or bell pepper instead of tomatoes with chilies. 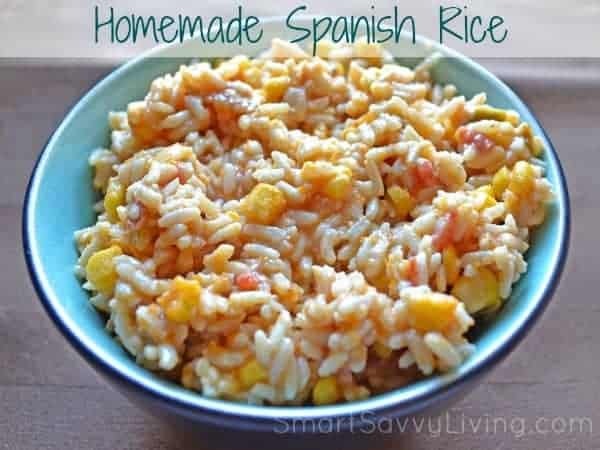 I hope you enjoyed this Homemade Spanish Rice recipe – be sure to check out our other recipes! Your Spanish rice looks delish! I love the smell and flavor that cumin adds. Absolutely a must. Thanks for sharing! This looks like a great side dish. YUMMY! I might try this one! This sounds delicious and easy, I’ve never had con in my rice but I bet it is good. Oh this sounds wonderful! I am always looking for neat side dishes for our mexican taco night! We would love this! Thanks!!!!!!!! 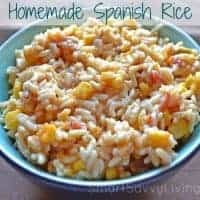 I have been looking for a great Spanish Rice recipe and have pinned lots to try, but yours looks different than most. I will pin yours, too. Never thought about adding corn, but I like the idea. Looks like a yummy recipe. I always have fresh garlic.